Barry Rowland of the Sim Racing Garage reviews the Club Sport Pedals V3 by Fanatec. The third iteration of the now famous ClubSport Pedals are often referred to as the best piece of sim racing kit for its money. To find out if this is true, Barry takes the pedals through the SRG review routine before sharing his final thoughts. Final thoughts on the Clubsport V3 pedal set from Fanatec. Right out of the box, this is a very nice looking pedal set. Keeping in line with most of Fanatec’s products, the fit and finish is professionally done. I was happy to see a lack of plastic parts on the build of this unit. And the all metal construction with solid steel rods tying the aluminum sides together, gives this set a nice rigid feel. When driving the V3’s I could not detect any flex from the pedal levers or frame components. A definite plus in my book. Using either heel and toe, or left foot braking techniques when you are driving, did not cause any drama for the V3’s. The overall pedal feel out of the box was on the soft side of my preferences. With only the clutch pedal having a feel that I didn’t immediately want to change. The brake pedal with the stock bumpers installed felt too soft. Even with the brake pre load screw turned to the maximum stiffness setting. The throttle pedal felt too soft and the throw was a bit long for me. I did install the black spring, but still wanted more resistance than it provided. It would be nice if Fanatec had one more spring that was just a bit stiffer. You can adjust the throttle pedal throw, but the process is not documented in the .pdf manual. I really like the way Fanatec has gone to a HAL effect type sensor set up to replace the potentiometers they had before. Much less maintenance and a longer life cycle should be had here. and ways to mount them in this package. They could have easily made them an accessory item. I will be reviewing the Brake performance upgrade kit, as I think it will make this brake pedal feel much better than it does now. And we can’t forget the V3 Damper kit, that I am also going to try. At a retail price of 330.00 dollars, this pedal set sits in its own little space when compared to the Logitech and Thrustmaster offerings. And the more professional pedal sets. Overall I think this is a fair deal when comparing them this way. I will still hold my final opinion until I have reviewed the Brake Performance upgrade and Damper kits. Vibrating motors to the throttle and brakes can use the Fanatec Wheel SDK (PC / PS4) are controlled by the game to make perceptible to continuous rear tire and oversteer. Pressure sensitive brake with 90 kg of load cell sensor (custom made). Adjustable brake pedal travel and stiffness (without tools). Ultra high 12bit resolution on all axes. Alternative D-shaped cleats with a curved design. Ideal for standing pedals. Pedal extensions to adjust the pedal plate angle and thus of the entire pedal lever. Completely new electronics. Parameters such as braking sensitivity or dead-zone can be adjusted during the race at the tuning menu of the steering wheel. Redesign of the accelerator for quick replacement of the spring. There are provided two spring strengths. Optional damper kit for throttle and brake. The hydraulic damping can be easily and infinitely adjusted by turning the wheel. Full Multiplatform compatibility. Works with all Fanatec steering wheels for PC, PlayStation 3, PlayStation 4, Xbox 360 and Xbox One. Solid metal construction made of CNC machined aluminum. Ultimate adjustability: Position the cleats in any direction, angle, spring strengths of clutch and gas, brake and brake pedal sensitivity. High-resolution pedals with contactless magnetic sensors on gas and clutch for long life and maximum performance. Vibration motor for simulating ABS and blocking tires. Controlled by a Fanatec Wheel: Compatible with all games. Dynamic Control in games via Fanatec Wheel SDK possible. Compatible with Colour Kits for perfect optical individualization. Compatible with any racing wheel from Fanatec or any other brand (Logitech, Thrustmaster, etc) if used on the PC. It works with any racing wheel if the game supports a second controller. Compatible with any Fanatec Wheel Base or Fanatec Racing Wheel with RJ12 pedal connector. To connect older Fanatec steering wheels with PS / 2 port, you need the optional PS / 2 RJ12 cable. The pedals are not compatible with the ClubSport USB Adapter. Please use the existing USB connection (PC only). 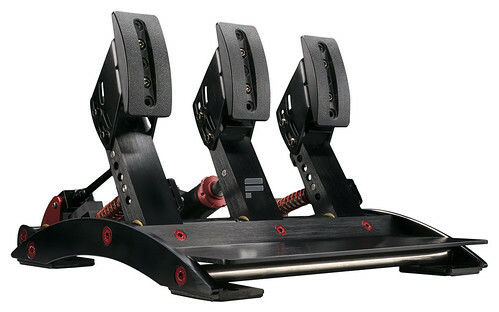 When connected to a Fanatec steering wheel, the pedals are compatible with all racing games. In this case, please read the compatibility details of the connected product for more information. 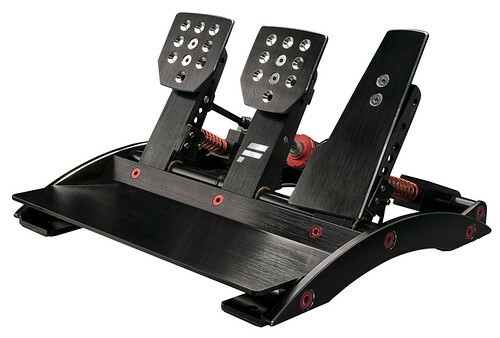 Consoles: The pedals can be operated on gaming machines when connected by a Fanatec Wheel Base / Racing Wheel. Please check the product description of the Fanatec product by which they are connected to the console. The use of a console via the USB port or with the Clubsport USB adapter is not possible. The vibration function of the accelerator pedal and the brake is not supported by all games. On the PC, the functionality can be established through plug-ins for our driver / third-party software when the game sends the telemetry data. Nice. Might be a good reason to go back to rF2. Nice interview. Two thoughts. What are ISI doing? What happened to "not rF3"? What are Reiza doing with Reiza 17? If they haven't licensed rF2 (yet) it seems years away.